So, how does a designer come up with a design? If they are doing their job properly, then it is a thorough process. It certainly isn’t about approaching the project with a design in mind and making it fit the property. First we identify problems and needs; next we come up with solutions to every single issue; and only then does the exciting bit — the drawing — begin. 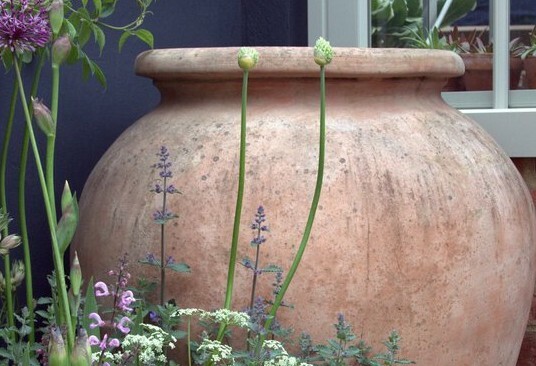 In another from our regular How to Design a Garden series of featured gardens, I explain one of our designs in a bit more detail, showing how the site problems were dealt with and the client brief met. For the finished design, please see Eco Friendly, Contemporary Roof Terrace, under our portfolio tab. A professional couple who both live and work in a small city. Keen to create some outdoor space where they could relax after work and at weekends, they wanted a dining area to seat at least 6 people, and another, separate space for lounging. Although larger groups of people may occasionally use the garden, the clients’ preference was for the space to feel intimate and be full of interest, rather than a wide expanse of empty ‘party’ space. They were eager to include some planting, and, as keen birdwatchers, wanted to encourage wildlife. Some light, overhead shade was necessary, particularly in the lounging area. An unusual house conversion, sandwiched between two non-residential buildings. The owners have recently added a large single storey extension along the south and west sides. Remaining groundzfloor garden space was to be used for car parking, bike/bin/general storage, so the rooftop was the only opportunity to create a proper garden. Approximately 95sq m in size, the rooftop is completely private, with a high wall along the north side. On the other side of the west boundary are some birch trees, which provide privacy and some shade/shelter in the summer. A small sunroom was to be added to the rear of the upper storey, with inward folding doors along one entire wall. Large glass doors provide further access from the house onto a wide passage along the south side. Access to the rooftop was relatively good, with wide internal corridors and double doors. The roof space presented the usual problem of getting hot in summer, but was fairly well sheltered from wind. Structurally the extension had been designed with a roof garden in mind, so weight was not an issue, and the roof had a fall of 1:60. Taking inspiration from the new extension and garden boundaries, I have created a grid-like ground pattern, with a variety of sized/shaped compartments. These were suggested by the vertical lines of the boundaries/building and the door frames. Their purpose is two fold; aesthetically they give the garden a sense of rhythm; and practically they create neat, rectilinear planting areas. This makes construction of the beds very easy, and also enables clear separation of plant species, giving a patchwork effect. To counteract the rigidity of these lines, soften the scheme, and add height, I have overlaid the pattern with some interlocking circular shapes. From inside the sunroom, a wall of glass folding doors gives a fantastic view of the garden, and I have deliberately planted right up close to them along one section, to really bring the outdoors inside. (Adequate access is provided by the tri-folding door on the other side). A small circular pool is fed by water from a shallow, elevated rill. Together these provide both a deep water habitat for pondlife, and a shallow bathing/drinking facility for birds. The sound of gently trickling water helps mask traffic noise, and has a cooling effect on a hot day. South facing loungers are perfectly positioned to catch the sun, but a circular, pergola-type structure overhead provides light shade during the hottest months. A decked pathway meanders through the grid of low, patchwork planting. 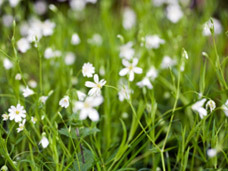 Species used are those suitable for semi-extensive green roofs, with an emphasis on year round effect and high wildlife value, including some nectar rich flowers. As both clients are particularly keen bird-watchers, the design includes a dedicated bird-feeding area, visible from the sunroom, but far enough from the house to encourage timid species. No cats can access the garden. Built into this area are two recessed log piles, placed on built-in, earth-filled trays (set flush with ground level). One of these contains a mix of twigs as well as wood, to encourage ground-nesting birds. A third recess is filled with looses stones, to encourage insects, lichens for moths, and possibly nesting wrens. Facing east, and low down, they are suitable for species that need a shady retreat. A wall-mounted box on the sunroom wall is better suited to bees that like sunnier sites. The small side passage, which benefits from the evening sun, has been transformed into a dining, barbecue and potager area. Vertical interest is provided by a salad/herb garden, built around the wall mounted water storage system, which is fed by house roof run-off. This maximises the growing area of the garden, and, along with an L-shaped raised bed, provides an opportunity to grow organic produce. A simple barbecue built from reclaimed bricks can remain permanently in situ, and a storage unit alongside provides space for garden tools, and a worktop for food preparation. For the finished design, please see, Eco Friendly, Contemporary Roof Terrace, under our portfolio tab. 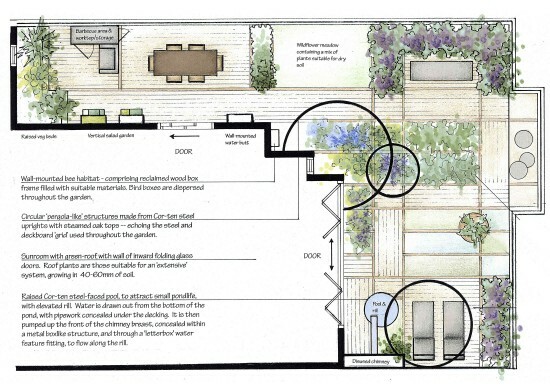 For a more detailed look at the design process, please see our Garden Design section. So, what do you think? Did we successfully fulfill the brief and solve the site issues? « Do I really NEED a Garden Designer? » First national, and now INTERNATIONAL AWARD winner!